Discussion in 'Gen 3 Prius Care, Maintenance & Troubleshooting' started by Den49, Jun 8, 2013. It seems odd, that your front caliper pins are looking ok, but the rears were nearly baked. Raise the rear end, and check wheel freespin with the parking brake released? It does not seem normal, for the rears to be running so much hotter. I can't see the engineers being happy with this, designing with such a difference. On ours, if I check all four wheels after an extended drive, they're all barely above ambient temp, if anything. The rears are no warmer than the front. I agree that it's strange people have all these signs of rear brakes getting so much hotter than the fronts. That shouldn't happen unless the rears are failing to release. Prius brakes shouldn't often get very hot at all except due to rare emergencies, to "aggressive" driving habits, or to failing to use "B" mode when appropriate. Frequently, I too check all four disk temperatures (if only subjectively with a finger) after parking. So far, none ever feel significantly above ambient. how about using something that is actually specified by toyota? Maybe because Toyota does not always have the best maintenance plan in their manuals. And on this subject: Routine cleaning and lubing the brake slider pins BEFORE you have a problem. That said, I believe there's a specific Toyota grease you can get. I did a front and rear brake inspection about 16 months back. I thought I'd put the rear brakes back together ok, inner pad's pin aligned with piston cross, but over the course of the next few months things went south. After about 4 months I opened it up again, and found the the inner pad's pin was riding up onto the piston spoke, causing uneven contact, scored disc, a mess. Could have been that, or a body shop that had redone the entire rear suspension, maybe a year further back. Anyway, what I take away is that alignment of that pin, and careful seating of the pads prior to applying the parking brake, to ensure that pin stays aligned, doesn't slip and ride up onto a piston spoke, is essential to avoid uneven brake seating, and drag. After replacing the rear pads and shims, and following the above steps during assembly, to keep the pin aligned, It appears to be all good. The discs have "cleared up", brakes not running hot. The rear brakes are wearing slightly faster than the front brakes. The brakes should last the life of the car, or at least as long as I intend to own it. Preventive maintenance such as cleaning and lubricating brake caliper slide pins pays huge dividends. P.S. A hot brake rotor can cause a severe burn. Instead of touching it, buy a non-contact infrared thermometer to check brake temperature for about $35.00. just from reading here, it seems 2010's have the most problems. i could be wrong, but i wonder if they made any changes after the first iteration. they have been used outside the u.s. for a long time though. There were changes and these TSBs were to address some those before the changes. ...and it's not lifetime either. Just did this lube job and used Sil-Glyde but will be redoing it with better lube since OP's follow up on post #72 shows stuck rear slide at 15k miles post service. So far in my google research, I see plenty of caliper pins getting stuck at even low mileage intervals like 50k miles. I've not come across anyone indicating a grease last beyond this range. Love to hear if there are longer lasting options. Having seen other caliper pin designs. I think I know the reason for this one getting stuck so easily. - When the caliper piston presses against the rotor on the inside side, there is a natural force to twist the caliper. The caliper body on the outside of the rotor wants to use the piston as the pivoting point and rotate away from the axle center. If this is allowed to happen, you will get angled brake pad wear and lower braking force due to less friction surface contact. So how do you keep the caliper from twisting? With the caliper anchored well on both sides of the rotor. The tolerance on the pin can be huge. In fact, don't even really need to lube it. Actually, I learned about the desire for the caliper to twist when I reinstalled tensioning spring incorrectly. Without the tension and lots of play on the sliding pin, caliper twisted, pads wore at an angle and reduced friction contact surface. - The Prius's caliper design, there is no outer spring so the slide-pin's gap with the sliding tube has to be really small to prevent the twisting motion. But the twisting force is there nonetheless and the pin will grind against the hole opening it inserts into. When you inspect the pins clearly, you can see wear marks right where it wants to twist against the hole opening on the bracket it slides into. I'm also guessing the black color we see on the old pin lube isn't dust. Rather, it is metallic mud similar to what you find on magnetic oil or atf drain bolts. So this is the reason I think why all the grease including factory ones only last maybe 50k miles in the best case. Just a thought. Love to hear what others think. Just wondering, belatedly: does that grease have any of the descriptive words, lithium, soap base or glycol? Just did this lube job and used Sil-Lube but will be redoing it with better lube since OP's follow up on post #72 shows stuck rear slide at 15k miles post service. - The Prius's caliper design, there is no outer spring so the slide-pin's gap with the sliding tube has to be really small to prevent the twisting motion. Such minute clearance is going to increase pressure significantly when caliper wants to twist when the piston is pushing against the inner rotor. Increased pressure also means increased heat. Thus, condition the grease faces is high pressure and high heat. FWIW, SilGlyde looks very similar in appearance to the OEM grease, and is recommended. I'll have a look at ours down the road, suspect it'll be ok.
FYI, looked over my records. 2011 Prius 69k miles. Dealer relubed the front brakes at 25k and they were pretty much stuck when I relubed them today so didn't quite make 45k miles (although service paper work didn't explicitly said they relubed the pins, could have just relubed the pad ears. Came another grease for the guides slide 08887-80609. Anyhow, white color 80609 appears to be the correct grease while my factory lube that lasted 69k miles in the rear is orange and unknown part number. High quality special grease. The MoS2 content provides the selected base grease with outstanding lubricity and high performance properties that normal grease simply does not have. During operation, a permanently adhering, ultra-thin molybdenum disulfide film forms on the sliding points. The film retains its lubricating action for a long time even after the grease supply completely fails. Extremely long lubricity, transportable in central lubrication systems. Designation acc DIN 51502 KPF2K-30. Service temperature: – 30 °C to + 130 °C. For installation, maintenance and repair of vehicles, tools, construction, agricultural and printing machines. For highly stressed bearings and joints, splined shafts, threads and guides. For constant-velocity drive joints. Not sure about anything with terms moly and paste. Silglyde (and similar) are silicon grease, recommended for pins. Moly paste is commonly used on pad backs. My impression is SilGlyde is a bit thicker than just about any other grease I've seen. Contacted the good folks at artsautomotive.com to see what they use and will report back. I'm guessing they see sticky pins all the time on this car. 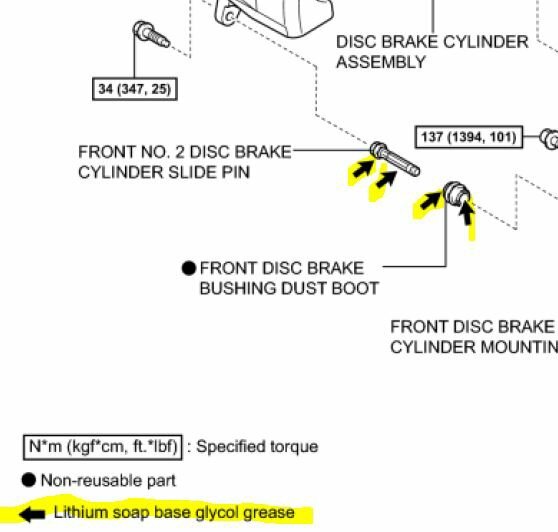 My understanding of the lithium soap based glycol "rubber grease" (the pink stuff) is that it is only specified for the parts that contact rubber (that is, the slide pins with their boots, and the piston with its boot and square-cut seal), and it's specified there because Toyota knows what their rubber formula is and what won't make it swell and stick. If you buy a Toyota rubber kit to do your own rebuild, the grease packet that comes in it is still the pink rubber grease, and if you buy a Toyota-rebuilt caliper, that's still the grease that's in it (at least as of last summer, when I did), so I don't have any indication that they've changed the spec. For other locations on the brakes, such as pad ears and shims, where contact with rubber isn't part of the requirement, they specify other greases. You get a small packet of their gray shim grease when you buy a shim kit. there's a person in another thread, who's rear brakes were completely shot at 17,000 miles. i wish he had seen this thread, he's selling the car because of it. the answer is yes.  compare the part number with your service manual. i saw that (confusing) document before, but according to toyota it's correct for the rest of the free world. do you trust russians? Check your rears aren't binding, having disassembled and reassembled them. Chock the front, raise the whole rear and with parking brake off, check if the rears turn with minor resistance at most. There's a pin on the rear pad backs that should lock in between the piston face spokes. When you reassemble it can be aligned correctly, but if you apply the parking brake before pressing the brake pedal repeatedly, getting them well seated: the pin can ride up on a piston spoke, which skews the pads, causes uneven wear, brake drag, rusting up and scored brake rotors, war and pestilence. Just kidding, that last bit. Front Brakes / Calipers sticking temporarily?